You’ve seen the stressed-out family. Someone is crying, another is fidgeting and then there is the angry one! If only you could show the family how stressed they are and what was causing the stress. Well, now you can. At the Family Trauma Institute, we’ve found that knowing is half the battle. When family members literally “see” what causes stress, they can begin taking steps toward healing. The FST| Family Systems Trauma Stress Chart Technique reveals, by each family member’s own disclosure, the intensity of stress as well as the top three stressors. Following this question, the FST therapist asks each family member how stressful home life is for them in relation to their child and their problems on a difficult week using a scale of 0 to 100 (0%=no stress; 100%=maximum stress). The question is asked “in relation to their child” because the child is the identified problem or why the family sought trauma treatment. While we recognize that each person has his or her own stress outside of the home (i.e., school or work), the reality is that the point of entry into the traumatized family is through the traumatized child. 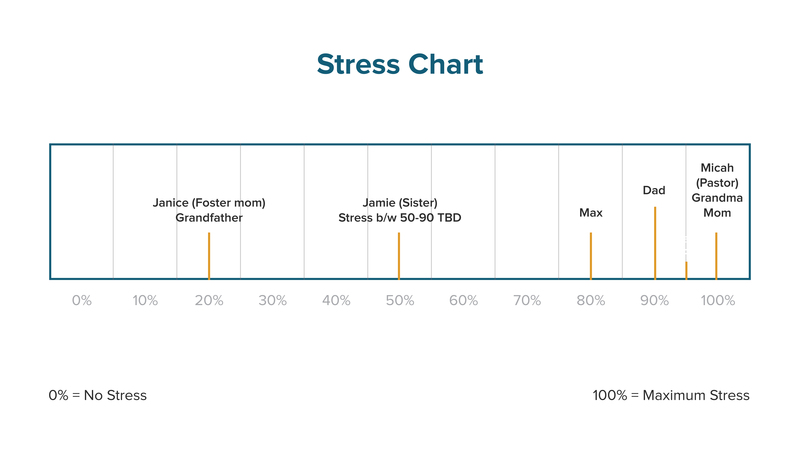 As a result, the stress chart follows this pathway. Looking at this chart, on a bad week, how much stress do you experience regarding your worry or concern for (name of identified problem child] in your household (not at work or school) again from 0 to 100? What is the first answer that comes to mind if 0 percent represents no stress and 100 percent maximum stress? Modify the question for the extended family members or institutions (i.e., school counselors, CPS (child protective service) workers, neighbors, friends) who do not live in the immediate household. The FST therapist should always ask “on a bad week”. If this same question is asked on a “good week”, you may not get an accurate picture of the actual problems that the child is experiencing. In addition, the word “stress” and “problem symptoms” are one and the same. The trauma therapist or psychiatrist will use the professional jargon of symptoms to diagnose a problem using the Diagnostic and Statistical Manual of Mental Disorders(DSM–5). However, family members, more readily accept the word stress instead of the term symptoms. As Figure 2 illustrates, the answers are then marked with an “x” over the number chosen. The “x” is identified with the person’s name or role in the family. In this example, 10-year-old Max is the identified patient. The session included the CPS Worker (Mary), the foster mom (Janice), Max’s dad, the grandmother, the pastor (Micah), and Max’s mom. Chapter Five of Treating the Traumatized Child: A Step-by-Step Family Systems Approach outlines the specifics of how to implement these procedures as well as the ideal timing of delivery. These responses underscore these benefits for the trauma therapist. Moves Family Members to Systemic Thinking – When therapy begins, the parent or caregiver are there for one reason: “For you (therapist) to fix their kid without being fixed themselves”. The stress chart increases the odds that the parents will see their child’s problem from a systemic lens and that the entire family must change, not just the problem child. Family members can visually see how stress is an interconnected problem. Lower Tension Levels – Traditional intake sessions often begin with questions such as, “What is the problem?” or “Why are you here?” Although the therapist needs answers to these questions, these types of questions often initiate immediate arguing or finger pointing. Family members then use the session as an excuse to unload anger or blame onto one another. In turn, the session can quickly escalate out of control. 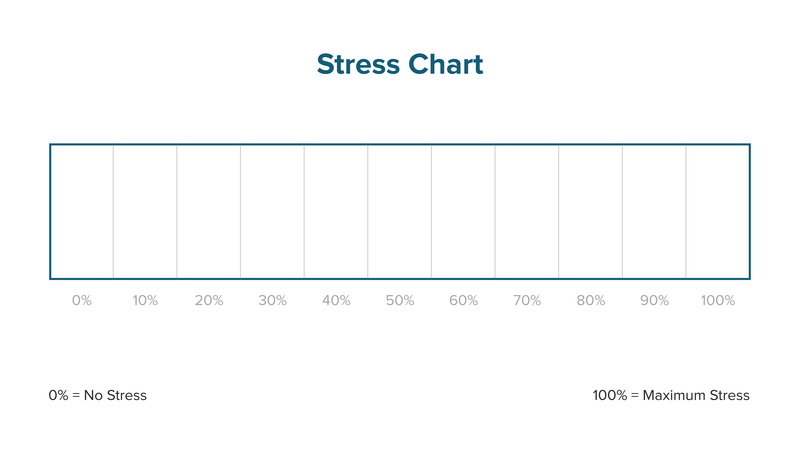 The stress chart, however, disrupts this pattern by asking everyone to look up at the wall or on the screen (not each other). Breaks Down Problems Into Bite-Sized Pieces– Traumatized families and their traumatized children often have multiple problems and are overwhelmed. In turn, the therapist often does not know where to begin and is also overwhelmed. Asking each family member to convert their overall stress into their top three problems allows both the therapist and family to see the problem as more manageable. The therapist and family can then prioritize and accurately assess which problem symptom(s) to address first, second, or third. If interested in learning how to apply the Stress Chart technique in your practice and becoming an FST Specialist, please explore our Membership Benefits. Members enjoy monthly 90-minute, on-demand technique application webinars with 1.5 CE units as well as podcasts, exclusive FST Application articles, a free copy of “Treating the Traumatized Child,” and much more to enhance your skills toward becoming a family trauma expert. Scott P. Sells, PhD, MSW, LCSW, LMFT, is the author of three books, Treating the Tough Adolescent: A Family-Based, Step-by-Step Guide(1998), Parenting Your Out-of-Control Teenager: 7 Steps to Reestablish Authority and Reclaim Love(2001), and Treating the Traumatized Child: A Step-by-Step Family Systems Approach(2017). He can be contacted at spsells@familytrauma.comor through LinkedIn.